Head out on the highway and rely on OKO for Motorbikes to help get you home again. Recommended for use up to 130kph (where laws allow) it is for standard motorbike on road tyres. (Also ideal for motorised rickshaws). Designed for regular touring bikes, scooters and mopeds that mostly travel on road (For specialist off road motorbikes or tubed moped/scooter tyres, use OKO XT). In common with any other sealant, it is not suitable for use in the ultra-low profile superbike tyres. By saving blow-outs, and even if there is a major puncture by slowing down the deflation and maintaining rider control, OKO literally saves lives. Courier riders and other professional users will particularly appreciate the protection and reduced downtime that it affords. When time is precious, OKO is invaluable. In testing by the Dutch police, they were so impressed that they demanded it be fitted to their motorcycle fleet. DO NOT USE with traditional CHROME WHEELS: these are extremely fragile and in common with any chemical, OKO may cause bubbling of the thin coating. OKO contains anti-corrosive ingredients and is safe for use with regular alloy wheels or steel wheels. 500 ml bottle deals with 1-2 tyres depending on size (see application chart). Fit it using the valve core remover and filling tube supplied in every bottle cap. (Or get the New OKO 150ml Injector for easier, super-accurate injection). 25 litre drum is ideal for retailer and service workshops: the heavy-duty drum pump is a one-time purchase and can be rinsed out again and again for repeated use in filling tyres rapidly. The product is designed for regular touring and road bikes (including tubeless scooters and mopeds) and fitted according to the instructions it is capable of use at speeds of up to 130 km/hr where legal speed limits allow. Users of V, W, Y, Z rated tyres should avoid using any sealant. Non Corrosive: Non Flammable: Non Hazardous. NO ADVERSE AFFECT UPON TYRES OR RIMS (contains anti-corrosion agents that protect steel and alloy wheels: do not use on chrome wheels which are vulnerable to any chemical). DESIGNED FOR TUBELESS TYRES. If tubes are used, the chances of a permanent seal are much reduced: check regularly for tyre damage or deflation which may indicate tube punctures that require tube replacement. 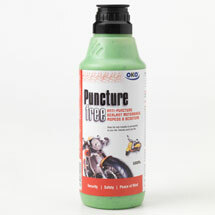 Speed-limited mopeds and scooters should use OKO XT Dirt Bike sealant. Colour: Light Green. Viscous. Low Odour. QUANTITY REQUIRED ­ refer to bottle, drum or application chart. Rinse product off any clothes (especially leathers) that it may be spilled upon.